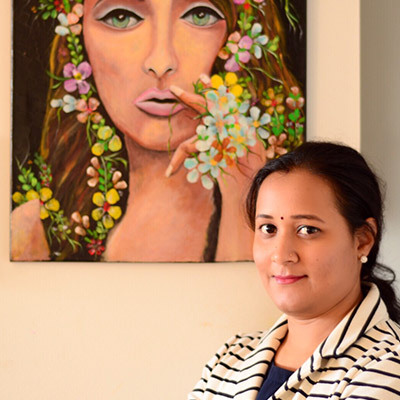 Born in Jabalpur, Madhya Pradesh, India, since childhood Ankita was always interested in creating Rangoli (colorful sand art form) and greeting cards for the family celebrations and festivals. This is when her love for colors evolved. Surrounded with friends and relatives, she has always been a free spirit personality and often a quite active member of various cultural/extra-curricular activities like folk dance, painting competitions, and debates during her school and college days. In 2008, she finished master’s in business administration. After working in Investment banking for a couple of years, she was married and travelled to Seattle (USA) with her spouse. With the motivation and support from her husband, the fascination of drawing and painting became intense and regular. In 2014, she published her first eBook (The Necklace Thief – A Mythology Adventure) as an illustrator on Amazon USA bookstore. The cover page illustration received rave reviews from the users. On a side note, the author of this book requested to keep the original cover artwork as memorabilia. Then they had to move to Austin, Texas during mid of 2014. She continued her persuasion for the art there as well and continued visiting various art galleries and kept learning about the international trends in arts. When they moved to Toronto, Canada by the end of 2015, using her previous experiences and learnings of gallery visits, she started taking part in various art exhibitions. She had a few successful themed exhibitions till date at The Super Wonder Art gallery (Downtown Toronto), The Beaux Arts Gallery (Downtown Brampton) and The Freedom Factory, Dover court road (Downtown Toronto). Her artworks were very well received by the visiting audience and she also successfully sold few of her artworks during these exhibitions. She truly believes that Indian folk arts, handicrafts, and handmade sculptures has a huge potential in international markets. Being a great admirer of various Indian folk artists such as Mithila’s Madhubani artists Ganga Devi and Smt. Bharti Dayal, Renowned Gond tribal artist Shri Jangarh Singh Shyam, etc. devoted their entire life to promote Indian art and represented it to the entire world, her dream and passion is to make these Indian folk arts and their colorful diversities famous globally. She like to play with bold colors and experiment with various styles on canvas such as, palette knife, modeling pastes for various textures and effects, etc. She also like to work with all kind of mediums such as pencils, pastels, charcoal, oils, watercolors, and acrylics on paper/canvas. Her subjects are often selected based on her life’s experiences, nature, or her imaginary fascinations of the emotions she feels for various people around her. Her message to the artists and aspiring artists is to continue your passion and let your creativity express through its forms and shape inspiring and igniting the spirits of humankind.